In Japan, the labor-intensive practice of apple stenciling is slowly fading. 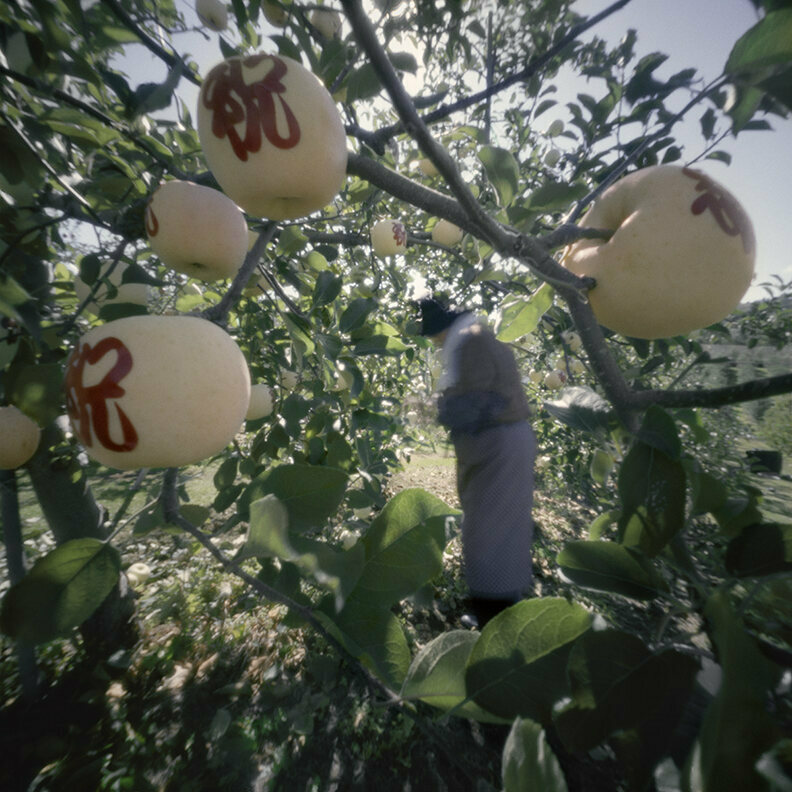 Across a small number of orchards in northern Japan, apples grow in cocoons. For a few months during the summer and early fall, the squat, fruit-bearing trees dotting the landscape dangle small, waxy pouches from their branches. But a closer peek would reveal that these little chambers are carefully tailored bags, each one enshrouding a tiny, cream-colored globe. These are mojie apples in their infancy, and they’re quietly growing into canvases. Harnessing the power of the sun—and a sticky stencil to block it—orchardists can turn these pieces of fruit into pieces of art. Not just any old apple can become a lucky mojie. Iwasaki says that Mutsu and Stark Jumbo are the best varietals for the job. Not only are they larger and more accommodating for stenciling sprawling images, he explains, but they have smooth skins, facilitating an easy application and removal of the stencils. But, aside from that, there’s nothing easy about the process. Cultivating mojie apples is a high-maintenance labor of love, and it takes nearly an entire year to perfect. Unlike apples grown in the United States, which are typically touched once (around harvest time), mojie apples are handled 10 to 12 times, by multiple farmers, before they make it off the tree. The process begins before the apples are even in existence. Beginning as early as January, orchard workers prune the trees, cutting excess branches to protect against overcrowding and ensure that each fruit will receive ample sunlight. As May approaches, the pale pink apple blossoms begin to open. 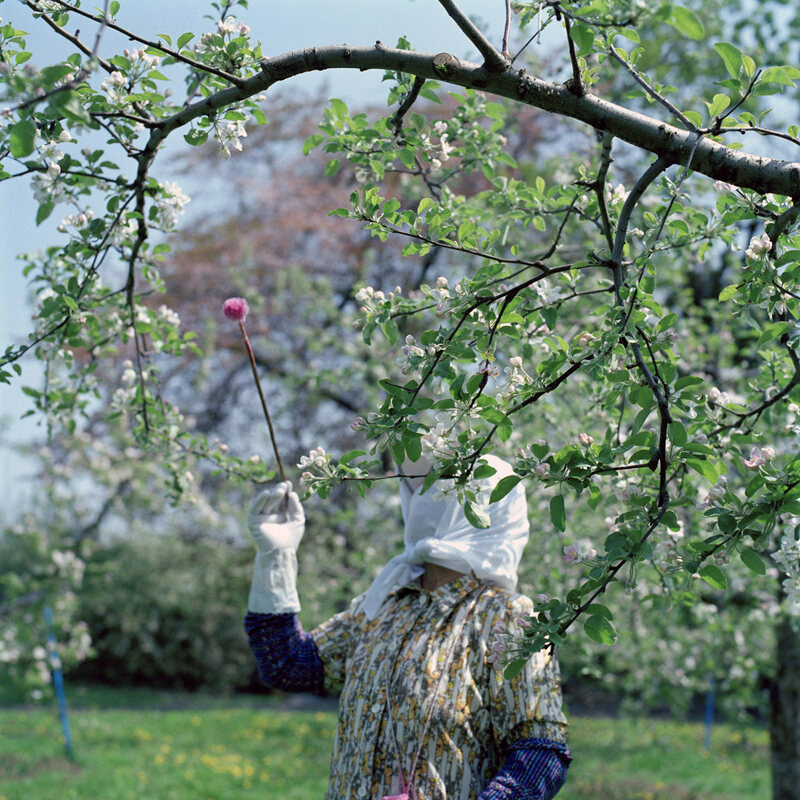 But the flowers are fleeting: Farmers cull the blossoms on each tree from about 4,000 to 200–400, which gives the apples room to grow as large as possible. The final fruit is 30 percent larger than most American apples. The remaining blossoms are pollinated, often by hand, using a fluffy powder puff wand. 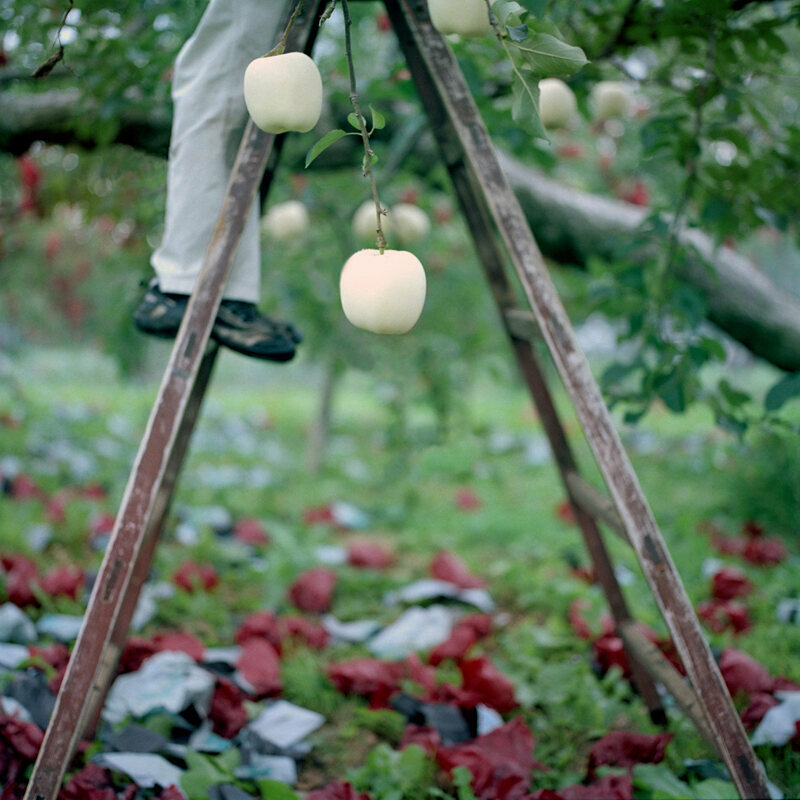 In the summer, workers return to the orchards to weed out wonky apples. Deformed and bruised fruits are plucked away, making room for the more promising apples. The bagging process typically begins in June, when multilayered bags are wrapped and folded cautiously over each maturing apple, shielding it from pests, the elements, and the sun. Keeping the apple out of direct sunlight keeps it a creamy white color, and increases the photosensitivity of the fruit’s skin. According to Ringo Daigaku, an online apple education center, this months-long period of light deprivation means that, once exposed to the sun, the skin will rapidly produce anthocyanin, a pigment that turns the apple a vibrant red. Throughout the summer and into early fall, the bags are removed one layer at a time. The outer bags are removed first, revealing translucent inner bags, which are often stripped four to five days later. Dealing with sudden sun is a delicate dance, as apples, too, get sunburns. If the temperature of the skin gets too hot, it will crack, and the inside may become brown. For this reason, some sensitive varietals require three layers of bags, which are removed gradually so as to avoid burning. Once the innermost bag is removed, and the pale, light-deprived fruit gets its first peek at the sun, it’s time to stick the stencil onto the skin. 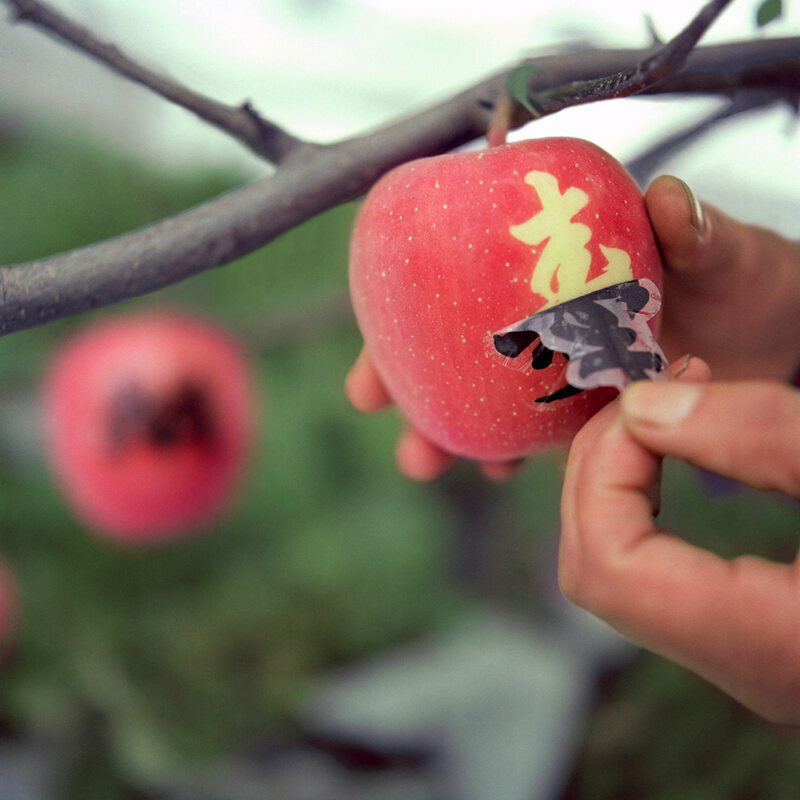 While simple designs, such as single characters, can be applied by hand, tweezers are used to apply and remove more complex stencils to each individual fruit. The stencils used today are stretchy, plastic adhesives, but that wasn’t always the case. At first, Iwasaki notes, growers used charcoal to draw characters onto the apple, washing off the design before harvesting. Since then, the stencils have gone through a few iterations, including designs made from Scotch tape and packing tape. The adhesive sheets currently used provide the most flexibility, as they can bend and stretch with the apple as it grows. 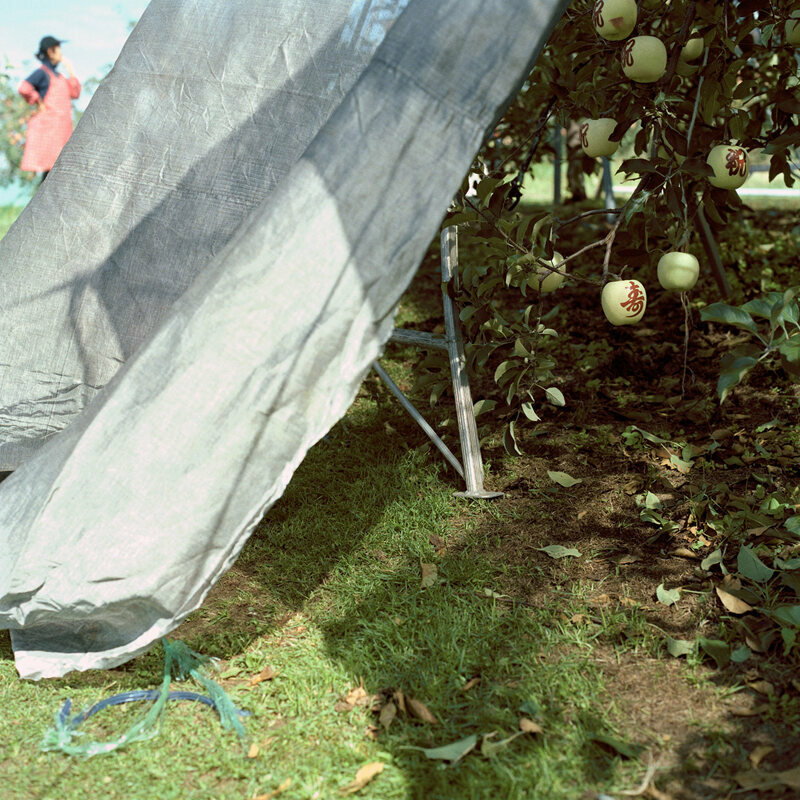 Once the newly-naked, stencil-adorned apples are exposed to the sun, farmers place reflective sheets below the trees to ensure light touches the bottom of the fruits. 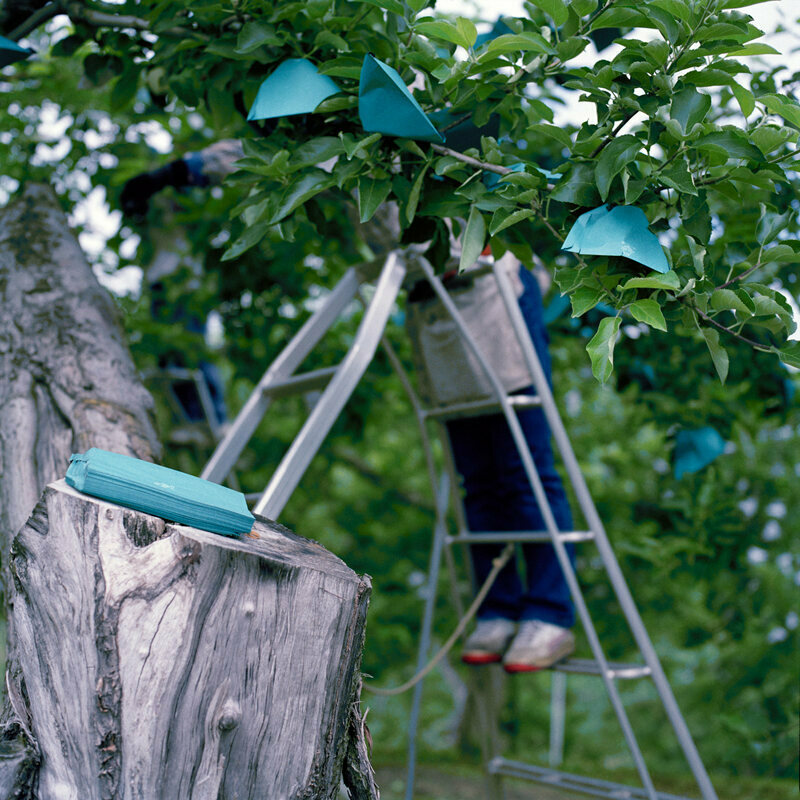 Growers return to the trees frequently to rotate the apples and ensure they’re getting even sunlight. The successful mojie apples are nothing short of perfect. The stencil is carefully peeled away, revealing a design in the shape of the sun-shielding seal. Sold in decorative boxes, wrapped in plastic along with a cushion, or stacked in four rows on “treasure ships,” (small, wooden boats meant to hold piles of mojie apples), they’re most often presented as exquisite gifts rather than casual snacks. Only after the artwork has been sufficiently admired should the recipient slice into the fruit. But sadly, Iwasaki says, these tantalizing treasures may slowly be disappearing. “It is very labor-intensive, so we are slowly decreasing production volume each year,” he says. 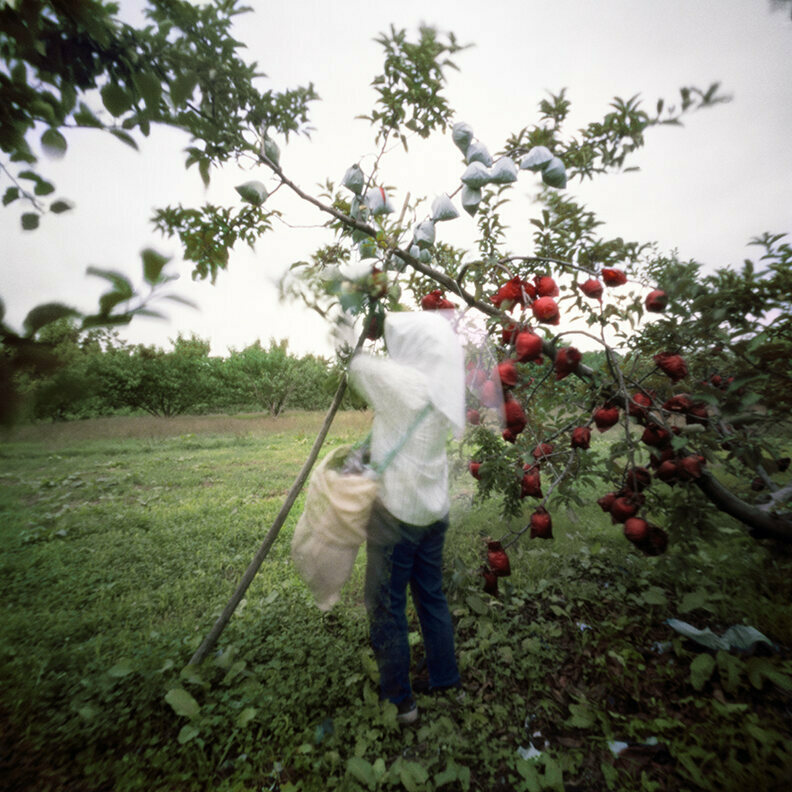 Between the natural disasters Japan has faced in the past decade, and the shrinking number of young people interested in continuing the work, many orchardists have struggled to get by. Even the traditional bagging process, applied to stenciled and non-stenciled apples alike, is slowly dying out. “I feel like it will disappear in the near future,” Iwasaki says.